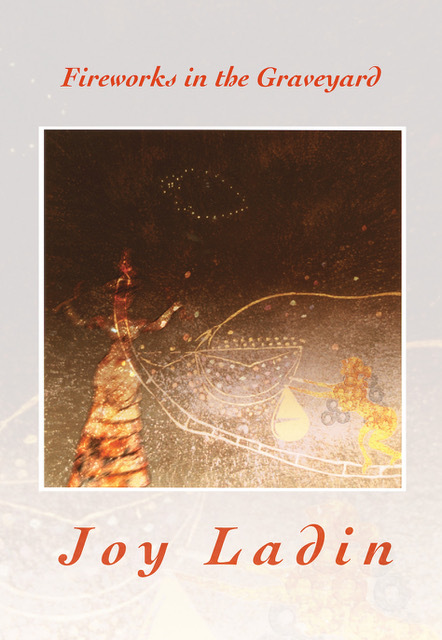 Joy Ladin’s eighth poetry collection, Fireworks in the Graveyard, is a testimonial of personal transformation. A stunning book tormented by fear and bodily discomfort, yet one also celebrating stalwart perseverance. Ladin’s personal experience with gender transition might be the book’s inspiration, but the work is poised for universal interpretation. The opening poem, “While You Were Away,” hurls readers into a moment which, as implied by the title, underwent some sort of change. It quickly becomes evident that this change was prolonged—an exacerbated feat of endurance—and marked with harrowing details: “The world / grew wider, warmer, more dangerous...Another ocean / deepened between us.” The poetic use of “us” is elusive, though there is a suggestion that it serves as an all-encompassing persona. The obvious speaker, however, attempts to lighten the mood by comparing the change to modern technological advancement. As if trying to assuage a conflicted internal dialogue, the world is described as something, “more densely cross-referenced / with emptiness.” There is an assumption, albeit a rickety one, that a resulting decrease in human connection is natural. But the certainty is fleeting, and Ladin’s choppy enjambment gives away the speaker’s actual physical and mental state—breathless and broken. fell in a distant desert. Abrupt line-endings slow the pace while acquainting readers with someone who is coping with dramatic change. There is definite apprehension regarding what came before, what is yet to come, and all that occurred in between. The poem’s concluding lines offer thematic insight. “Love, / mine and yours and ours, / sank and surfaced and learned / to live on what it isn’t.” The phrase, “mine and yours and ours” is telling. Yet another insular and dissociative clue to serve the collection’s woeful stage-setting. The book is delivered in three parts, each named for a poem within it. These sections include the speaker, a lover, and often a mother or young boy. is staring in my direction. I must remind him of his mother. Because Ladin is a trans woman, the line, “I must remind him of his mother,” suggests the possibility of a poetic mirror where the mother (and the boy) is also the speaker. Ladin interchangeably uses characters and various pronouns to refer to this poetic “I”. Loading these players with different poetic responsibilities widens the speaker’s perspective and gives voice to less-accessible emotions. By offering myriad avenues for empathic response, Ladin’s strategy ensures readers a degree of relatability. Rather than allow this device to remain obscure, readers are kept apprised by Ladin’s employment of an inclusive ‘we’. “We knew this would happen, that I would forget / how to talk to you, that you would forget / to want me to.” Such intimate disclosure triggers, if not increases, involvement. Leaves are used as emblems for a troubled body, often placed alongside mundane objects to enhance the strength of their imagery. In “Simmering”, “A distant dog yelps. The first leaves, / like me, begin to yellow // near the top of a tree / that’s otherwise alive and well.” And again in “Death,” “It’s always summer now. Thunderstorms clatter past, / one leaf adds its green to another / until the trees turn black.” The speaker conveys the separation between mind and body—the mind is alive, while the body seems to be dying. In “Ephemera,” Ladin lets imagery carry the burden. “My vitals are good, the sky blue, / clouds preen like swans in the shallow river. // The falls are close but quiet.” Any previous hope for the unknown future seems at risk. Last night, I managed to walk around the corner. Every step, a new sweet scent. so I sang the old songs instead. This allusion to prayer, essentially a call for help, is also evident in “Now and Then.” A version of the opening line, “When I get bored, I talk about life and death,” is repeated three times. The poem ends with an answer, “When life and death get bored, / we are what they whisper.” Sagely advice passes from the speaker to a less-confident self. It serves as a reminder that when one is at their lowest, they still have power to manifest their future. They have a choice. that goodness can be disturbing. Readers may feel kinship with the speaker when Ladin writes, “I want to say goodbye to my body / before my body says goodbye to me.” Though self-acceptance might be what is ultimately at stake, to simplify it as such would unfairly lighten its gravity. “Not Unlike” emphasizes the speaker’s complexity, while eschewing sentimentality and any self-indulgence. of the son who turns away when I wave. “In the Hall of Minerals” proves the speaker does not want special treatment. “I know how it feels to have strangers ogle / my mounds and clefts, to be analyzed down to my atoms.” An eventual acceptance of self comes from a challenged past. in carbon seams and basalt basements. molecules we shouldn’t, shattered lattices. That’s why they call us specimens. Not because we’re so very different. Because difference is all there is. “Journey to the Center of the Earth” likens earthly events to life’s need for death. The speaker asks for forgiveness “Here’s where I should apologize / for fussing about a personal matter / and change the subject to the Holocaust, the Armenian / genocide.” But it is wrought with authenticity. There is no desire for handouts or easy way out. The speaker’s multiple voices finally fuse in “Finishing School.” “It’s time...I won’t be graded / on a curve. Sigh.” This “sigh” is an exhale of relief. One readers can take too. Tom Griffen is a North Carolina writer with California roots. In 2015 he received his MFA in Poetry from Pacific University. His work has previously appeared in Tupelo Quarterly, and also in Prairie Schooner, Crab Orchard Review, Harpur Palate, O-Dark-Thirty, The Quietry, and others. In January 2018, Tom is beginning a walk across the USA. Follow him at www.tomgriffen.com.